If you’re consistently picking the right products and quantities, for the right customer, at the right time, with the right conditions, and at the lowest possible cost, then congratulations and keep up the good work! In paper-based picking, it’s not uncommon to see errors due to omitting items, picking wrong items, or miscounting quantities. Any sound WMS system can offer solutions that reduce or eliminate these errors. JDA (formerly RedPrairie) WMS takes this further and offers a variety of picking options that can significantly improve productivity. These options are flexible and can work out of the box. However, if optimally configured and customized, these picking solutions will yield greater results. Rely on system verifications: Design your SOP to double-verify almost every step in the picking process. You can loosen this later as needed. For example, utilize area’s pick verification flags to have user scan and verify LPN, quantity, item, etc. 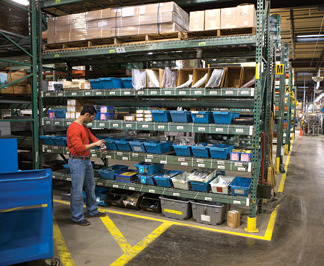 Count Back or Count Near Zero can also be used to count remaining inventory in a location in-line with picking. Use pre-labeled cartons: With modifications, we can enable relabeling system generated carton# during cluster picking. Look for family groups: If you would like to make completing multi-line order picking via a short picking path the norm and not the exception, then analyze how customers place orders to slot your pick faces and group your items. This can take time to complete but can be very rewarding, as it ultimately reduces travel distance, your picking enemy #1. Pick your smallest Unit of Measure (UOM) first: You don’t want your easily picked full cases waiting for your time-consuming picks. Let the smaller picks lead the bigger picks. Consider using Bulk Cluster Picking instead of Cluster Picking: The former provides the ability to scan a batch of cartons (just like cluster picking) but walk to every distinct location in the batch exactly one time. When you pick out of a location, you will scan the entire quantity needed for all of the cartons at one time instead of having to scan each pick individually. This is available in JDA WMS (RedPrairie) 2004.2 and up. Consider using Bulk Picking (new in 2012.1): This enables picking higher UOM, which fulfills multiple orders with a single pick. This not only frees up labor by combining the demand of multiple shipments into a single pick and reduces travel distance, but it can also reduce the number of replenishments to the pick face. Consider using Pick Stealing (introduced in 2008.1): Newly received Inventory may sometimes represent an alternate source for picks that have yet to begin. Picks sourcing from interior storage could then be redirected to source from receiving area instead. If the receiving area is adjacent to the picks' destination, this redirection will reduce product movement and therefore improve operational efficiency. Keep in mind that cross-docking takes precedence over pick stealing, given that the former is pre-planned and the latter is an ad-hoc process. If you have enjoyed this blog post, I recommend downloading our free "Top 5 Secrets to Maximizing Your JDA WMS Performance" white paper. You can access it by clicking on the link below.